The intermediate laser course upgrades attendees’ tool usage from the 30 watt Epilogue Zing to a 150 watt Boss LS-3655 laser cutter. 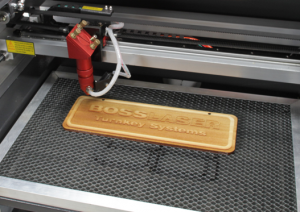 Featuring a significantly larger bed and the improved capability of cutting up to ½” thick material in a single pass the Boss laser is a cutter’s dream. In this certification workshop attendees will learn the basics of properly configuring the laser cutter, choosing the correct materials for the tool, and general safety guidelines when using a laser. Attending our Laser cutting for beginners workshop is required prior to attending the Intermediate laser cutting workshop. Similar to the Laser cutting for beginners workshop this class does not include file preparation or design elements necessary prior to using the laser cutter. MAKE does offer a course specific to file creation and preparation called Laser Cutter – File Prep for Laser Cutting.